Custom Colonial in Desirable Location! Stunning custom Colonial near desirable Thompson Pond and the Kettle Brook Golf Course! Sun-filled kitchen with granite counters, glass subway tile backsplash, center island and upgraded stainless appliances. Cathedral, wood ceiling family room addition overlooking the exquisite grounds. 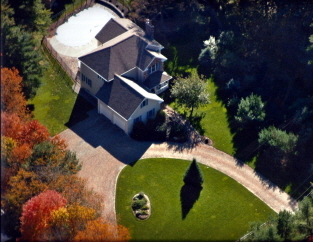 Pebbletec heated pool and hot tub spa, 2 car garage with side entrance, shed and garden area, all surrounded by woods! Serene living room with Mendota gas fireplace and hardwood floors throughout the first floor! Master bedroom with updated private bath and DOUBLE WALK-IN CLOSET! PRIVATE OASIS with 36x18 Pebbletec heated pool and hot tub spa. Professional landscaping and custom built stone walls! Generator hook-up, plumbed for wood stove if desired, irrigation system, central vac, custom window treatments and new Buderus propane heating system and HW heater!